One day, there were two people who wanted to ride on the boat. Their names were Melani and Jillian. When they were rowing everywhere, they saw two baby alligators. One of the mothers of the babies came out with its whole body and it attacked the little girl’s brother. Her friends were up by the bridge, and they saw everything. We were in that part of Florida because I was researching the post-sideshow lives of carnival workers. So it was kind of fitting that we stumbled on this old Hollywood starlet, Silver Springs State Park, who has starred in the Creature From the Black Lagoon, and James Bond, and Sea Hunt. These artesian springs provide fresh water to more than half of Florida. But also, because they are exceptionally clear — you cannot tell whether you are looking six feet down or 65, they are the perfect backdrop for filmmakers who need an underwater stage. We took the glass-bottom boat tour — designed starting in the 1870s to show off this wonder — and then rented kayaks. The wildlife warning “if you see the baby, the momma is nearby” had been impressed upon us by the good folks over at Wildlife Inc. the day before, so we responsibly kept our distance when we twice paddled past young napping gators. “There’s a big one down there!” hollered someone from the bridge as Melani and 5-year-old Jilly headed toward home base to return their tandem kayak. Twenty-one-year-old Trevor was close behind them, having sped away from me when I told him he looked very redneck-y with his ball cap and a snoozing gator over his left shoulder. Melani eased the kayak to a safe space to take a look at the sunning eight-footer, and Jilly dropped her paddle into the water to help out. 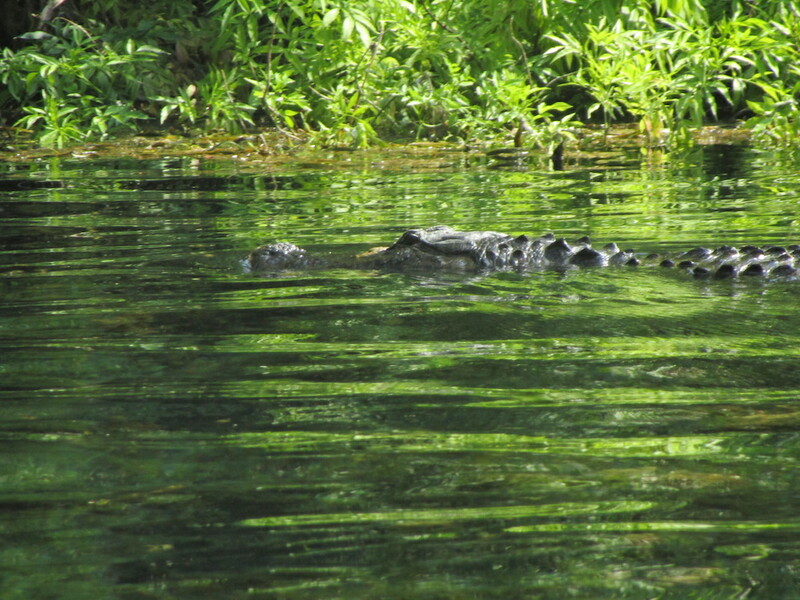 The sound and the sudden jerking motion of the boat made the gator open her eyes and lift her head, which made Jilly scream, which made the gator say, “Nope nope nope damn humans” and slither away through the water, cutting off Trevor’s kayak and slapping the tip of it with her tail. The little audience at the top of the bridge hollered their approval. We’re awarding Silver Springs State Park the ever-elusive yet completely arbitrary five out of five stroller wheels, and not just for alligator sightings. We can’t name all the birds we saw, and there were dozens of turtles and hundreds of fish. The park is rich with history going back thousands of years to when indigenous peoples used this water and harvested the land. The paths are wide and clear — though we only got to walk a bit of them because of time constraints. The food at the canteen is very well priced, and there are many tables throughout the park to picnic instead. Entrance to the park is only $2. The glass-bottom boat and kayak cost extra (you can launch your own kayak for $4), but the price is reasonable and the experience well worth it. We were on the water for a total of three hours and retreated to our Airbnb exhausted and happy. Fun adventure! Florida has nice parks!